Is It The Right Hen For You? Recently, we delivered you an article on the Wyandotte chicken breed, and have received lots of requests to discuss other varieties; with the Blue Laced Red Wyandotte topping the chart. The Blue Laced Wyandotte is perhaps the most beautiful Wyandotte. In today’s post, we will talk about the history of the bird, its disposition, egg laying ability and reasons why it is the right hen for your flock. The late 180s witnessed the original creation of the Wyandotte bird. It was created to serve a dual purpose; meat and egg. The Wyandotte was originally bred from Silver Hamburgs, Brahmas, and the “proto” bird (the Mooney). The first of the Wyandotte breed was the Silver Laced – other varieties followed. The Wyandotte birdie became hugely famous here in the US, also in England and across Europe too. It witnessed a large reduction in numbers starting in the 1940-50s’, when it was surpassed in meat and egg production by the “industrial” hen. A spark in the increase in interest of the breed has helped recovered its popularity. A lot of sources argue that the Blue Laced Red Wyandottes was created back in the late 1800s’ by a Mr Heidenbluth of Frankenburg, Saxony. However, a document surfaced later and its existence disputes this, stating that the Blue Laced Red Wyandotte was created here in the US. Upon reading this document, it appears that in fact a big number of the stock of Blue Laced Red Wyandottes originated in the US and were shipped to the UK where they became really successful. Chances are most of the stock imported into the UK were sent to Germany where further breeding and refinement of the bird continued. In the 1920’s, Blue Laced Red Wyandottes became largely famous in Germany. In 1929, more than 100 birds were shown at the poultry Show in Leipzig, Germany. Only in 1929 was it admitted to the German Standard of Perfection in 1929. Some time after that, the German stock was imported to England and finally made their way back to the US in the 1980s’ thanks to Lowell Barber. 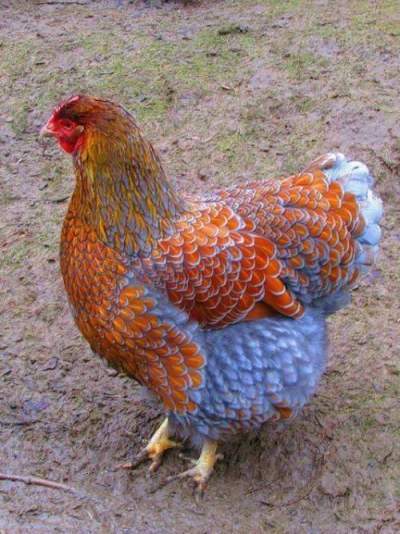 Currently, the Blue Laced Red Wyandotte rooster and hen is not a recognized variety of the Wyandotte family, although this, I believe, is just a matter of time. A dedicated group of breeders are working on the standards and will be submitted to the APA when ready. Since there really is no set standard, bird folks can basically sell their inferior versions of a Blue Laced Wyandotte without lying about it. However, the body shape must conform to the standard laid down for all Wyandotte chickens. It would seem that lots of birds that are being called Blue Laced Red Wyandottes are barely conforming to the physical attributes of a Wyandotte bird in general. Wyandottes are broad backed birds with lots of curves to them and dense feathering. The body is broad and deep with a gentle “U” shape, supported by short, stout legs, The beak and legs should be yellow in color. Earlobes, wattles, comb, and face should be red, and the comb should be a rose comb set close to the head. Eyes are reddish bay in color and are deep set. Roosters should weigh in around 8 ½ pounds and hens at 6 ½ pounds, although they may look heavier, it’s all feathers! Let’s talk about the genetics of this bird- I hope this enlightens you. Here is a simple “breakdown” of the components of the Blue Laced Red Wyandotte for ease of discussion. First of all, the “Red” color needs to be a mahogany red- no other red is acceptable for the base of coating. The color red is a dominant color gene. There are two kinds of melanin: pheomelanine and eumelanine. Pheomelanine gives yellow/red (called gold) and Eumelanine gives black. If you add red enhancing genes to the pheomelanine, you will get the deeper mahogany of Rhode Island Reds which is the required base coat for the Blue Laced Red Wyandotte. Lacing is simply the narrow contrasting band along the edge of the feather. The lacing is as a result of the genetic makeup of the bird. For generations, dfferent breeders have worked hard to get the lacing perfect. Even so, following a molt, the position of the lace can be “smudged” on a few feathers as a result in change in environmental factors such as temperature changes etc. Now for the interesting piece – how to get Blue Lacing! There exist two blue genes in the chicken world. The first is the “Lavender” gene ( also known as “self-blue” here in the US) which is a recessive gene. If you breed lavender to lavender, the results will be lavender chicks. But, if you breed lavender to “whatever”, you will get “whatever”. The lavender gene needs two copies (one from each parent) to make lavender. The second blue is Andalusian blue– a diluting gene, which is an incomplete dominant. You only need one copy of the Andalusian Blue to make blue. For instance, if you breed a diluting blue to say a white bird, you will get 50% blue and 50% white- blue will not breed true even if you breed blue to blue- blue x blue = 50% blue, 25% white and 25% splash. You would agree with me that putting all this together in one chicken can really be challenging. Breeding for color and body perfection is time consuming and exacting, this is why the birds are kind of expensive. 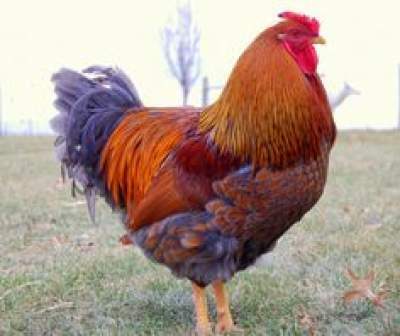 When breeding goes according to plan, you end up with a lovely Blue Laced Red Wyandotte rooster or hen. Wyandottes are a gentle and friendly breed, although not too “cuddly”, but a good addition to your backyard flock. They can appear to be happy, but this will differ from bird to bird. They are also known to talk a lot, although this too varies from bird to bird. They do not bully others and definitely do not put up with any nonsense from other hens. They make great mothers and can get broody quickly; they will often accept any eggs placed under them for hatching. A great advantage if you want to raise your own birds. They tolerate confinement well, but do better when allowed to forage on their own. When it comes to egg production, you can expect around 200 eggs/year of medium to large brown eggs. There are times the Wyandotte chicken can suffer from low fertility rate. This is often as a result of the rosecomb gene –thus the scarcity of good quality stock. Otherwise the Wyandotte is prone to the usual problems like other hens. The dense feathering need to be regularly checked for mite or lice infestations and treated accordingly. You may need to trim the fluff around the rear end occasional to facilitate mating and prevent it from getting in the way of things. Now that you’ve decided to add the Blue Wyandottes to your flock, be ready to spend $30.00 to $40.00 on good quality chick. Although you can get them much cheaper at different hatcheries and private breeders, in some cases the quality and purity of the strain has been faulted by manipulated breeding in a rush to produce plenty chicks and generate income. It really is what you pay, what you get. They are bound to grab the attention of folks if you are into exhibiting your birds, but as earlier stated they are not an accepted variety of the Wyandotte breed. As more people exhibit the breed, it will become more noticed by the APA and perhaps expedite their acceptance. Like lots of Wyandottes, the Blue Laced Red will perform well in a 4H setting, being of a steady and calm behavior and tolerant of a wide range of situations. Being non-aggressive and docile, they are good with children and they certainly would beatify your family flock. They perform well in cold weather really well and are a favored in the upper Mid-West and North Eastern states. Although they will handle heat well, they will need a shaded area to retreat to and lots of cool water of course. The Blue Laced hen or rooster is certainly a “neck turner” bird and would be a cool addition to your own flock. They mix well with other breed although they prefer the company of their own kind and don’t really socialize too much. These Wyandottes chickens variety is a case of “buyer beware”. If someone is offering you one of these hens for $10.00 – be cautious. You need to check the overall body type for Wyandotte characteristics, if you can, demand to see the parent birds. If you really don’t mind that your hen conforms to the high standard that breeders are aiming for- then help yourself. However, if your plan is to breed these, choose your hen carefully. Coloration can be fixed over time, skeletal defects, and body posture cannot. Do you already have these cuties in your flock already? They are certainly becoming more popular with lots of backyard enthusiast who are looking for something different in their flock.